They welcome any patients who would like to become involved in any of their current and future projects. We also have a "virtual" patient group - patients who are happy to be contacted via email on an infrequent basis, answer survey questions and give opinions about our services. If you are interested in joining our virtual PPG, please download a form here and return it to the surgery. We will not use your email address for any other purpose and will never divulge it to any third party. Method of engagement with PPG and/or PRG: Face to face, Email, Other (please specify) We have held monthly meetings during the year face to face, email contact with the main PPG and virtual PPG and phone contact as and when required with members of the PPG & virtual PPG. . Virtual Group – Cranleigh invites every new patient to be on the virtual group as they register (form enclosed with registration pack) so that way we are covering every age group and ethnic group. This membership is representative of our wider practice population and one in which exchange of ideas, recommendations and general feedback can be made. Given the increase in our white non-British population we have identified that this group is not sufficiently represented and we have sent invitations throughout the year to join the PPG. We have had some success in recruiting to the virtual PPG and 24% of this virtual group is now white non British. In addition 27% of the virtual PPG are in the age range 25-34 making it much more representative of our younger age group. We have also targeted the white non British group with different nationality signs being put in reception with essential medical information in different languages. With this information we have also given brief details on the PPG group as well as invitation to ask about the group and joining the PPG. We have undertaken a number of recruitment drives, using notices in waiting rooms and on the call screens; direct invitation from clinical staff during consultations. Leafleting, and face to face recruitment exercises in the surgery by current PPG members. We have also encouraged patients to complete sign up forms via our website, to complete sign up forms via a dedicated notice board within our patient information area and included invitations with every new patient pack. We regularly detail recruitment within the PPG newsletters which is also put on line and sent to all virtual members. A member of the existing PPG wrote an article detailing what kind of activities that were involved by the group and the good work they did to try and encourage patients to join. Contact has also been made to the local health visitors asking them to approach the wider community that we do not always see on a day to day basis. The emphasis has been to try and ensure a good spread of age ranges and ethnic background where possible. It is clear however that recruiting new members of any age or any background is challenging. The greatest success continues to be in that age group were the patients have more regular contact with the surgery as they get older. Through discussions with younger patients time constraints and working during potential meetings continues to have an impact on their availability to committing to join the group. The PPG remains focused on all patients when considering activities to be undertaken and is why one of the priorities for the year was accessing the surgery through technology which was aimed at all age group and backgrounds. Following our efforts we have had some success in attracting three people with an interest in becoming members of the PPG.This has led to one joining their first meeting in March of this year. Whilst undertaking PPG patient training exercises in September and December all represented and non- represented patient groups coming through the surgery on those days were approached to joining either the virtual or main PPG. This demonstrated an attempt to engage a true representation of those patients we see through the surgery on a day to day basis. Invitation to Bridgwater College for a representative to join a PPG meeting. Are there any specific characteristics of your practice population which means that other groups should be included in the PPG and/or PRG? We adopt an all- inclusive policy to engaging all potential patients regardless of their age, ethnicity or background. There are no specific characteristics of our patient practice population that have singled out any group other than those already detailed. Friends & Family pilot tests- In October 367 responses were received equating to 12% of consultations during that period. Any individual written feedback that was detailed on these responses was also reviewed. National GP Patient Survey Results were reviewed at the PPG monthly meeting in October. Synopsis of results was discussed with some outstanding results being achieved in relation of telephone access, overall experience of making an appointment, our availability of opening hours and the overall patient experience and the high percentage that would recommend this practice. Areas for improvement were also discussed including helpfulness of the reception staff and time available for the nursing team. Review of emails received to the PPG email address. CQC review including independent questionnaire feedback and face to face questioning of patients. Local surveys relating to internet access for patients in relation to booking appointments, accessing medical records and repeat prescriptions. PPG members speaking to patients during training and recruiting sessions. Annual review of complaints and suggestions. Patient suggestion box, feedback to reception staff, feedback to clinical staff. Review of social media comment via own Facebook page. How frequently were these reviewed with the PPG and/or PRG? The frequency of reviews are monthly or bi-monthly as agreed by the PPG and in conjunction with scheduled PPG meetings. A full and detailed review of the year’s feedback was undertaken at a monthly meeting with appropriate priorities for action being agreed. Generally the feedback in all respects was extremely positive but areas for improvement were highlighted. Patient Online access. From discussion and feedback to the PPG it was agreed to seek patient knowledge and accessibility of online facilities. In view of increasing patient demand in an attempt to help the patient experience for those that wanted to, online options to be understood and used by more patients. Do you use the internet in any way to interact with the surgery? Do you know you can book some routine appointments on line? Do you know you can order repeat prescriptions online? These results were discussed with the PPG and it was agreed that promotion of how to access online facilities was important primarily to give patients another format of accessing the practice. This would be important for those patients that had access problems and for a large number of patients that were working through the day and unable to call into the surgery or have time to phone during the day. This would also in turn help the pressure seen on reception as the practice continues to grow through patient demand. Discussed results with IT manager and reception supervisor to clarify the best options of increasing patient knowledge and usage of online facilities. The website has been updated to give clearer instruction to patients, reception staff have been speaking to patients to advise them of the changes. To prompt discussion a revised flyer and information sheet were compiled and given out to patients to give clear instruction on how to access online facilities. Our patient information screens in the waiting area were also updated with clearer instructions and the results of the survey were detailed within the PPG newsletter given to patients and sent to the virtual PPG. We have seen an increase in online usage for repeat prescriptions by 45% from March 2014 to March 2015. We have seen an increase in online apt booking by 32% from March 2014 to March 2015. We will continue to promote and advertise with posters and information flyers. These results have been publicised in the PPG newsletter ‘Your Voice’ which is sent to all virtual PPG and PPG members. This information is also available within the surgery in patient waiting areas and within in our communication board. This has also been discussed with the PPG group itself and publicised on our website (through this report). Description of priority area: On reviewing the various elements of feedback and in particular the National GP Patient survey results one of the lower scoring areas was the helpfulness of the receptionists. 81% of respondents found the receptionists at the surgery helpful. This was not a bad score but a lower scoring area for the practice. In an attempt to improve all aspects of the practice it was agreed to review the service received by the reception team and make any appropriate improvements. To ensure standards were fully adopted and adhered to staff observations were undertaken to ensure the practice was giving the best level of service it could. From completing observations it was apparent there were pressure points in patient demand which made it harder to maintain service levels. An ongoing plan was drawn up to support the reception team with more resource and redirecting staff resource to support this area and other key roles within the practice. Friends & Family feedback very positive within pilot carried out in October where written feedback relating to the reception staff was extremely positive and was publicised on our website. From January we have monitoring results & feedback and again this looks extremely positive. CQC feedback – During our inspection in November the CQC independently completed patient feedback questionnaires as well as speaking to patients in the waiting room. It was very pleasing that there was no negative feedback in either format of asking patients their thoughts. 21 comment cards were completed by patients and given to the CQC in advance of their visit. In our CQC report they commented that all cards contained positive descriptions and staff were described as polite, efficient and professional. Description of priority area: Patient access and acute pressure seen on patient demand for same day appointments and routine appointments on Mondays. Discussed in detail with the PPG to gain an understanding of the demands for patient access. Whilst continually busy through the week with an ever growing patient list Mondays were highlighted as the day with the greatest demand with frustration from patients and pressure on the surgery in meeting demand. Telephone triage had been adopted at the start of 2014 by all the Doctors and whilst this was the only way to manage extreme patient demand some patients were abusing the system by requesting continual urgent contact. The PPG felt that many patients were affected by the actions of a small percentage of people. The practice has undertaken monitoring of this situation in consultation with the doctors. It was further agreed to update patient screens warning of position on Mondays and to avoid this busy time for routine requests as well as ordering routine prescriptions. Reference made to online options in line with priority one to reduce demand. Discussed utilising the telephone system to better deal with the volume of calls. The practice telephone provider has subsequently undertaken a site visit and in conjunction with the practice introduced a simplified automated message system to better manage and route incoming calls. This has included bypassing calls to other parts of the practice and routing calls to our busy dermatology clinic from reception to ease the pressure on this area enabling them to deal with same day requests. Following a few teething problems this has improved matters but we will continue to monitor. A follow up meeting with the partners and appointment co-ordinator was undertaken given the pressure seen and further actions agreed as well as endorsing the suggested changes already detailed. This included utilising 2 on-call doctors for Monday mornings and increasing the number of booked day only appointments by slightly changing working patterns. In addition clinical meeting time has been reduced on Mondays to allow further time with patients. Overview of all appointment and triage appointment timings reviewed to ensure fit for purpose. Agreed that time permitting one of the partners will join future PPG meeting to give their perspective of patient access the pressures seen and how they are coming with demand. The first such follow up session is planned for 24th March. The initial results are greater patient access on Mondays and we have seen an improvement in managing patient demand by reception and the clinicians. This initial improvement will be reviewed by undertaking a follow up meeting with partners of the practice to gauge the impact of the changes made as well as seeking feedback from the PPG at future scheduled meetings. The existing PPG has been in existence for some considerable time and are particularly proud of what they have achieved over the years with the absolute highlight being the full involvement in moving premises in 2011. The then chair of the PPG opened the new practice. More recently the practice was inspected for the first time in November 2014 and the PPG played an important part on the day in giving feedback to the inspection team. At short notice members changed plans and played their part in making the day a great success. Three members of our committee have also played made representation at the federated PPG and county group meeting. 2013/14. The group had hoped to install a patient information computer in the waiting room at the surgery and then analyse the use and value of this as the next stage of their project in 2013. However, shortly thereafter the ideas piloted by the group were taken on board by the County IT team and we understand that a Patient information computer (one of the main planks of the PPG project) is to be supplied to all practices in due course. Unfortunately this has not yet been completed and the group were therefore notable to take the project further until such times as the computers are installed. It is disappointing that there has been no progress county wide with this project but we continue to liaise with the IT team and the PPG are aware of the ongoing situation. As the group were unable to continue with the IT project they looked at telephone consultations and telephone triage. For telephone consultations a questionnaire was completed regarding the quality and expectation regarding the patient experience. The PPG considered the results and felt that to be fair on patients they should be advised, when booking a routine phone call, when the GP was likely to call them back. The PPG appreciated that each GP works to their own schedule and manage their surgeries in balance with their other work, checking results, discharge letters, insurance reports, visits and scripts in their own individual way. The committee felt that it was not realistic for all the GPs to call back at the same time or, at busy periods, for them to all to be required to call back in the morning. They therefore made a recommendation to the partners that each GP be asked to provide a window during which they would hope to undertake their telephone consultations which could be indicated to the patient when the appointment was booked. This would ensure that patients were not left waiting for a call all day and reduce the likelihood of a flurry of calls in the evenings with patients chasing calls from GPs. This recommendation was accepted by the Partners and each GP has now identified a1-2 hour time slot within which they will each try to undertake their calls. As patients book a routine call with their chosen GP they are now give the time window for that call. These time periods are specific to each GP. This arrangement commenced in December and to date is working well. For telephone triage The PPG felt that the trial of triage for same day appointments was looking very positive. Particularly as the practice had seen a considerable increase inpatient numbers since relocating the current site. It was agreed that an extension of this trial to all GPs should be considered and has subsequently been adopted as standard working practice. It was also suggested that training may be needed for those GPs unfamiliar with this type of consultation and this recommendation was also accepted and training scheduled for early in 2014. The PPG were concerned to ensure that patients were not “lost” within the system and bounced from one session to another when they did in fact need to be seen. The GPs were asked to recognise and manage the system to prevent this occurring and to agree protocols whereby such patients could be picked up quickly. Training took place and the surgery has adopted telephone triage for all doctors throughout 2014. 2012/13 The idea for the in house computer was developed within this year and is addressed in the year after report. A detailed analysis of phone call handling was undertaken with 2 surveys completed. This was following patient feedback that a dedicated line for general queries would be a good option. Survey 1 monitored 1000 calls made into the surgery with only 14% being for general queries. A further survey was initiated were staff were asked to write down the nature of general query calls over a week to indicate if they were able to answer immediately, had to put caller on hold or had to call back. Whilst the PPG felt it was a viable option and the telephone provider was engaged with a second apprentice being taken on that year matters were not progressed. Telephone handling has not caused an issue in subsequent years and the practice to score highly in patient questionnaires regarding this aspect. This aspect has however been revisited with access on busy days and addressed in the latest report for the current year. Results were discussed and taken forward in the form of a Better Me project providing an opportunity for patients to take more interest in and better control of their own health. Following a year of change with a new practice manager there has been full engagement with the PPG through monthly meetings and ad hoc discussions with individual members of the PPG. This included 1:1 discussions with the Chairman to give a briefing of the work previously undertaken by the PPG. Monthly meetings are open and informal and all parties speak freely regarding any issues. Members felt fully engaged and that their thoughts and recommendations had been listened to. By using the virtual group to get a younger & more diverse ethnic participation. A number of recruitment initiatives where PPG members have spoken to patients. Using notices in the surgery information area, messages on the patient information screens & direct invitation from clinical staff during consultations. Open invitation and discussion during training events undertaken by the PPG when showing patients how to operate the surgery POD. Agreed at latest meeting to invite representation from Bridgwater college. Yes by reviewing various sources including Friends & Family test, GP national survey, and local surveys sent to the virtual PPG given to patients and included in the PPG newsletter. NHS choices, CQC feedback, review of complaints and a designated email address advertised on the practice website. Yes all priority areas were discussed at meetings held during the year. This was formalised in a meeting in October where information from various sources was reviewed and we selected the priorities we felt would have the most benefit. Initial ideas were discussed agreement made on what we could do and evaluation of actions and what impact this had on patients has been made during the year. Priority one came from an initial idea by us in respect of accessing patient records and use of online facilities. Priority 2 was decided following a review and analysis of the GP national survey were we concentrated on the lower scoring areas. Priority 3 was the result of open discussion at one of our monthly meetings where pressure was seen on patient access. Priority 1has seen more options to patients in the way that they can interact with the practice. There has also been an increase in online usage which has allowed patients to book appointments and order repeat prescriptions easier. Priority 2 has seen an improvement in the service provided evidenced by CQC report, CQC comment cards, Friends & family test and more compliments and less complaints. Priority 3 through change to working arrangements has led to greater patient access at peak times; this concept may be rolled out to other days. Most important aspect is that we felt fully involved, listened to and taken notice of. This is demonstrated in the improvements seen. Notice has been taken regarding our responses to suggestions. We also feel that there has been effective use of money and that we have an excellent practice from receptionist through to clinicians. The Cranleigh Gardens Patient Participation Group provide help and support to the practice in a number of ways. They comprise two distinct groups of patients . § feedback any comments or concerns they may have regarding services. Sincetheir inception the PPG have provided considerable help to the surgery. They have undertaken surveys and arranged petitions; run health events and represented the patient body on other local groups including the Bridgwater Bay Health Federation of PPGs and the Bridgwater Hospital monitoring group.They provide critical feedback on services and act as a conduit for patients wishing to make suggestions for change. They produce a newsletter “YOUR VOICE” approx 8 times per year. The PPG have a notice board in the Patient Information Area and a suggestion box adjacent to Reception. They also have their own area on the website. The current committee (Feb 2014) has 10 members, 3 male and 7 female with an age range of 40-73 years. All of the committee are white British. We have actively sought additional members particularly from amongst the younger and/or non British patient population but unfortunately with limited success. This year the group arranged a coffee morning at the surgery to try and encourage other patients to consider joining the group and 2 new possible committee members were identified. The vast majority of patients prefer to remain as Virtual members and this category grows steadily and is a much better representation of the overall practice population profile. John Bishop was elected Chair in 2012 and represents the practice at County PPG Chair meetings, Federation PPG meetings and keeping the patient voice heard in discussions regarding local issues such as Bridgwater Hospital, Hinkley Point and public Transport. He has been very active this year in trying to persuade the Highway Authority and the bus companies to amend their routes into Cranleigh Gardens. He leads the response from the PPG to the Clinical Commissioning Board (CCG) and the COG. The on-line membership currently stands at over 150 members, 54 % female and 46 % male, representing the wider practice population in both age and ethnic background. The profile of the on-line membership is made up as follows. The ethnic mix of the on-line group is 77 % white British, 13% white non British, 8% Asian and 2% Other. The committee work to an agreed terms of reference, which can be found at the end of this report, which is reviewed annually. The full practice profile figures remain somewhat inaccurate as ethnicity was not a category that was collected at registration until recently. Our best estimates would suggest a non British population of 2.6% currently. In the last three years we have seen a significant increase in registrations from patients of a white non-British background i.e. an average of 15% of all new registrations during 2013 were white non- British, and 30% of all new births were also white non-British. Currently we have 50.5 % male and 49.5 % female patients. The age rage of the patients is broken down as follows. When the PPG was first formed in 2008 members were recruited using a combination of personal invitation and advertisement. Subsequent to this we have undertaken a number of recruitment drives, using notices in the waiting rooms and on the call screens; direct invitations from clinical staff during consultations, leafleting, and face to face recruitment exercises in the surgery by current PPG members. The emphasis has been to try and ensure a good spread of age ranges and ethnic background where possible. In early 2011 we started to enclose an invitation to become a committee or virtual member with patient registration documents and this has resulted in a significant increase in numbers and a far more representative group. This year, 2013/2014, we have arranged the first of a series of coffee mornings at the surgery during surgery hours to talk to patients about the work of the PPG and to try and encourage a wide membership of the committee. Travel plan to accompany the planning application for the new surgery - Interviewing 500 patients attending the surgery on a particular day. § Collating travel information after the move to the new building to identify the base statistics for Somerset Council’s Ion Travel Plan requirements - face to face interviews of patients attending the surgery. § Pharmacy needs survey to support the appeal for a pharmacy licence at the new surgery –face to face interviews with patients. § Branch surgery services. Mailed survey to 100 randomly selected patients in the vicinity of the branch surgery to identify preferred opening hours and possible additional services and reflect these wishes back to the practice. In 2011, following the move to the new premises, and the subsequent significant increase in new patients joining the surgery, the committee undertook a survey on the extension of services to weekends and the possible addition of some new services. The results and related discussions led to the idea of a “Better Me” project, as detailed in last year’s annual report, providing an opportunity for patients to take more interest in and better control of their own health.This was followed by further surveys in 2012 resulting in the formation of the final project. The group hoped to install a patient information computer in the waiting room at the surgery and then analyse the use and value of this as the next stage of their project in 2013. However,shortly thereafter the ideas piloted by the group were taken on board by the County IT team and we understand that a Patient information computer (one of the main planks of the PPG project) is to be supplied to all practices in due course.Unfortunately this has not yet been completed and the group were therefore notable to take the project further until such times as the computers are installed. Calls can be booked with a preferred GP for their next available morning surgery or with the duty doctor, on the same day, for more urgent problems. Messages,where a patient wishes to leave a message for a GP, but does not need to speak to them in person , are managed separately. · issued as part of the Sept/Oct PPG newsletter. Of the 78 patients who responded 49 (63%) had used the telephone consultation service and of those 90% had found it to be excellent or very good. 69%of the calls had been returned in the morning. Not all of the patients had been told when the GP was likely to return the call but of those that were 59% were phoned at around the time they had been given. 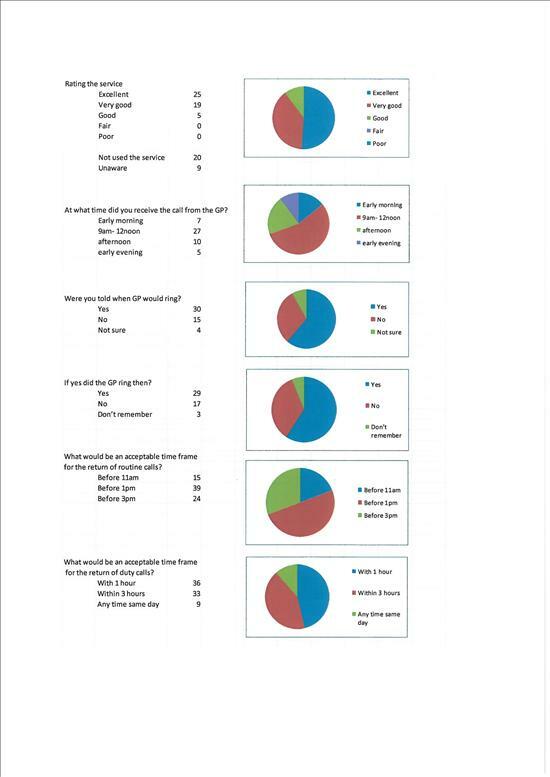 When asked what an acceptable time frame would be for routine calls (i.e those booked for a morning surgery) 69% felt that they should be before 1pm. For duty calls (that could be requested at any time of day) 88% felt they should be returned within 3 hours. Over the 23 Triage sessions audited, 578 patients had requested same day appointments. All were called back and of these 96 (17 %) were asked to come in for same day appointments. The remaining patients were managed via the phone call. Of those patients only 27 (4.7%) called back to make further appointments forthe same problem within 5 days. Only two complaints were received during the period, one from a patient who felt that the they should have been given an appointments by the GP during the telephone call and another from a patient who would not accept that they could not be given an appointment until the GP had spoken to them. Although it was too early into the pilot to be able to survey patients who had been triaged anecdotal feedback during the coffee morning in December would suggest that the vast majority of patients welcomed the very quick call back and resolution of their problem without having to come into the surgery. A very small number (3) did appear to bounce from one triage session to a second session and were then seen. In all 3 cases the doctors who saw them suggested that they had not needed an appointment but had been unwilling to accept a diagnosis by phone. For those who were brought in as part of the triage process the risk of an overrunning surgery and therefore waiting times ,was significantly reduced and the GP was able to give more time to the more urgent cases. The PPG discussed these findings at their meeting on 12 November and agreed the following action plan. The PPG considered the results and felt that to be fair on patients they should be advised, when booking a routine phone call, when the GP was likely to call them back. The PPG felt that the trial of triage for same day appointments was looking very positive. Particularly as the practice had seen a considerable increase inpatient numbers since relocating the current site. It was agreed that an extension of this trial to all GPs should be considered in the New Year and this was planned for the second week of February 2014. It was also suggested that training may be needed for those GPs unfamiliar with this type of consultation and this recommendation was also accepted and training scheduled for early in 2014. The PPG were concerned to ensure that patients were not “lost” within the system and bounced from one session to another when they did in fact need to be seen.The GPs were asked to recognise and manage the system to prevent this occurring and to agree protocols whereby such patients could be picked up quickly. The PPG is regularly consulted on all aspects of the practice’s services including extended hours and opening hours at the branch surgery. The practice at Cranleigh Gardens is open Monday to Friday from 8.00am to 6.30pm and on certain Monday evenings between 6.30pm and8.00pm and Saturday mornings between 8.00 am and 11.00 am. The Branch surgery at Westonzoyland is open every Monday and Thursday from 8.30am-12.30pm. The Cranleigh Gardens Pharmacy is open from 8.00am – 10.30pm Monday – Saturday and from 8.00am – 9.00pm on Sundays. Access is available for pre booked routine appointments, with the doctor or nurse of choice, up to six weeks in advance as well as same day appointments with the duty doctor. The practice also offers routine and same day telephone consultations. Appointments can be booked by telephone, in person or on-line via the website. Visits are undertaken as required, to the housebound. These appointments are available on regular Monday evenings and Saturday mornings and are primarily aimed at patients who work during the week and cannot attend the surgery during normal opening hours. Where slots remain unfilled 48 hours before the session they will be released for routine appointments. All full-time doctors and GP Registrars are available during each extended hour session(other than when they are on leave). Those working part –time will be available pro-rata. A PPG survey in 2011 identified that there was no appetite for nurse appointments at weekends and as a result nurse appointments are not offered during these sessions. In 2012 the practice trialled arranging flu clinics on some Saturdays in conjunction with extended hours, but these clinics were not well subscribed. However in 2013 a further trial was undertaken and this time the clinics were fully subscribed. However the non-attendance at these clinics was at a significantly higher level than those held during the week. The practice is considering offering Health Checks on Saturday mornings to try and encourage the take-up of these checks. A group of patients and practice staff who meet together for the benefit of the practice and its patients. To collect, collate, discuss and disseminate survey information to and from the wider practice population. To act as a representative group to influence the local provision of health and social care. A secretary will be elected, to serve for two years, to take the minutes and help in the preparation of the quarterly newsletter. In the event of this post not being filled the practice would provide a member of staff to take the minutes. The practice manager or her deputy will be in attendance. Meetings will be scheduled to allow for attendance by one of the doctors once or twice per year. A quorum will comprise 3 members plus at least 1 member of staff or a GP and the maximum number on the committee at any one time will be 15 members. If there is a waiting list for membership then members who regularly attend meetings will be asked to consider standing down after 4 years, although they may retain “virtual” status. They will be eligible to re-join the meeting group after 1 year. Any patient may volunteer to be a Virtual Member and there will be no limit on the number of patients in this group. Members in this group will be contacted on-line and will be asked to respond to a number of surveys each year. Virtual members will be offered the opportunity to help with projects and will be kept informed of all meeting decisions via the “Your Voice “newsletter. PPG responses to suggestions from the patients will be displayed on the noticeboard, in the newsletter and on the call screens as appropriate. The PPG at Cranleigh Gardens is a group of patients who have volunteered to support the practice in a number of ways. § act as a representative group to influence local health provision. Since its inception the PPG has provided considerable help to the surgery. They have undertaken surveys and arranged petitions; run health events and represented the patient body on other local groups including the Bridgwater Bay Health Federation of PPs and the Bridgwater Hospital monitoring group. They provide critical feedback on services and act as a conduit for patients wishing to make suggestions for change. They produce a newsletter “YOUR VOICE” six times per year. The PPG has a notice board in the Patient Information Area and a suggestion box adjacent to Reception. They also have their own area on the website. The current committee (Feb 2013) has 8 members, 3 male and 5 female with an age range of 40-73 years. All of the committee are white British and we are actively seeking additional members particularly from amongst are non British and younger patient population. After4 years as Chair, Jean Rawlinson stepped aside at the end of 2012 to take a well earned break but still remains an active member of the committee and is also a very enthusiastic member of the Bridgwater Bay Health Federation PPG which is made up of representatives from all 11 practices within the Federation. John Bishop was elected Chair in 2012 and has already made his mark, representing the practice at County PPG Chair meetings, Federation PPG meetings and keeping the patient voice heard in discussions regarding local issues such as Bridgwater Hospital, Hinkley Point and Military Veterans. He leads the response from the PPG to the Clinical Commissioning Board (CCG) and the COG. He has also successfully lobbied the Council to provide road markings on thee ntrance to the surgery and ensure that visibility was improved on exiting from the car park. The on-line membership currently stands at over 100 members, 56 % female and 44 % male, representing the wider practice population in both age and ethnic background. The ethnic mix of the on-line group is 78 % white British, 12% white non British, 8% Asian and 2% Timorese. The full practice profile figures are not as accurate as we would like as ethnicity was not a category that was collected at registration until the last few years.Our traditional population was predominantly (99%) white British, with less than ½ % white non British and a very small number of black, Chinese and Asian patients. In the last two years we have seen a significant increase in registrations from patients of a non-white British background and as a result we would anticipate that the next set of figures will show our non-white British patient population to have reached about 2.3%. Currently we have 50% male and 50% female patients. This year, 2012/2013, in conjunction with the Federation PPG, members are attending meetings of local groups of young mothers and fathers in the surrounding villages to try and encourage membership of the PPG from this sector of the patient population. To identify younger members of the patient population who might consider membership we have also approached the local college with a view to their considering membership of the committee as a recognised community component of a Duke of Edinburgh Award. § Collating information on patient travel modes to help prepare a Travel plan to accompany the planning application for the new surgery - Interviewing 500 patients attending the surgery on a particular day. In 2011, following the move to the new premises, and the subsequent significant increase in new patients joining the surgery, the committee undertook a survey on the extension of services to weekends and the possible addition of some new services. The results and related discussions led to the idea of a “BetterMe” project, as detailed in last year’s annual report, providing an opportunity for patients to take more interest in and better control of their own health. The next stage of this work was to develop these suggestions into specific proposals and then to resurvey patients to ensure that there would be sufficient interest in them to develop the proposals into services. · Surveys handed out to patients during consultations. A copy of the survey form is shown below. In total 227 forms were completed on- line or on paper. The results indicated that 72% of patients would like a dedicated line for general queries, 53% would like to see a patient access computer available in the surgery and just 17% would be interested in self-help groups. The indication was that the help-line was the service which patients felt they would most appreciate and use. There are obviously cost implications to this service, not only in the setting up of the line, but also in ensuring that it is adequately manned. To try and evaluate this and further and identify how busy the line might be, a further survey was undertaken, this time of the calls currently coming into the surgery. Staff were asked to monitor all calls coming into the surgery over a full week. The results showed that the surgery received over 1000 telephone calls per week and a further 500 calls to the script line. Of the calls made through Reception, it appeared that 14% were for queries that were not directly related to the work of the surgery and in most cases required the receptionist to either put the caller on hold or to ring them back later with an answer. These calls were those which the PPG felt might be better handled by a dedicated information help-line thus leaving the reception lines free to take calls for appointment bookings. Having ascertained this information the PPG committee decided to ask the staff to undertake a second survey for a further week to try and identify more fully the types of questions and queries that were being asked during those calls to ascertain if they would have been suitable for a help-line facility. The staff were asked to write down the nature of any such calls received over a week and to also indicate if they were able to answer immediately, had to put the caller on hold whilst they found the answer, or had to call back. Only7% of these calls could be answered without requiring the caller to be put on hold or rung back. The PPG committee considered these results and identified that whilst the results clearly supported the need for a help-line, there was not always a clear distinction between the types of queries that patients themselves may feel should be answered by reception staff and those on a help-desk. After discussion it was agreed that there would need to be a facility for transferring calls between the reception line and the help line internally.In addition there would also need to be an option for the patient to be diverted to the help line at the outset of the call i.e. via a voice message and extension number. It was felt this type of arrangement would be best catered for by using one of the Surgery’s phone system’s D/D facilities rather than installing a new line. From the survey of call timings it was apparent that, other than on Mondays, calls seemed to be fairly evenly distributed between mornings and afternoon and that the helpline would need to be available throughout the day. Asa result of the data collected from the surveys the PPG drew up a new action plan at their meeting in November 2012 to take the projects further. It is hoped that if successful the help-line might eventually be made available to patients across the Federation. for general health queries and an in-house patient computer with access to health web-sites. Phone surveys have identified that approximately 14% of all calls coming into the surgery via the reception line are for general queries that would be more appropriately handled by a help-line. This is dependent upon staff availability and funding. Initial plans were for this to be a totally separate phone line, but after discussions and analysis of calls it would seem more appropriate to use a D/D line within the current system, thus allowing direct calls from outside but also enabling quick transfer of calls from the reception line. The practice hope to be employing a second apprentice from March/April 2013 and once they have completed their initial training this appointment will free up another member of staff to man the help-line in association with their other work. The help-line will have a voice mail facility allowing staff to call back if they are already dealing with another call. The PPG and staff have been working to develop a list of appropriate and bona fide websites for all of the main disease groups, support and carer organisations and associated secondary care services. A supplier of an appropriate touch screen type facility has been found and discussions are underway to obtain as to the most appropriate configuration to enable ease of use for all ages and abilities. Work is now underway on identifying a source of funding to purchase the computer, which will be situated in the Patient Information area in the surgery. Although this was the least popular of the service proposals it was still felt that there is a need to trial a group for those patients who did feel it would be of benefit. The launch of the group will be made known to individual patients in the relevant disease/problem area, by directi nvitation. The practice at Cranleigh Gardens is open Monday to Friday from 8.00am to 6.30pm and on certain Monday evenings between 6.30pm and 8.00pm and Saturday mornings between 8.00 am and 11.00 am. The Branch surgery at Westonzoyland is open every Monday and Thursday from 8.30am-12.30pm. Access is available for pre booked routine appointments with the doctor or nurse of choice up to six weeks in advance as well as same day appointments with the duty doctor. The practice also offers routine and same day telephone consultations. A PPG survey in 2011 identified that there was no appetite for nurse appointments at weekends and as a result nurse appointments are not offered during these sessions. In 2012 the practice trialled arranging flu clinics on some Saturdays in conjunction with extended hours, but these clinics were not well subscribed. The vast majority of flu appointment contacts are made by phone rather than letter and despite being offered Saturday appointments it was clear from these calls that the great majority of these patients preferred to come in for their flu jabs during normal hours. The practice is currently considering offering NHS health check appointments, on Saturday mornings and during Monday evening extended hours to try and expand the take-up for the service which has been very poor to date.